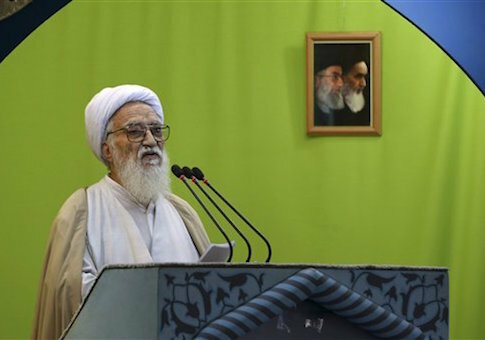 A senior Iranian cleric delivered Friday prayers in Tehran while standing behind a podium that declared, "We Will Trample Upon America," according to photos released by Iran’s state-controlled media. A Persian-language message on the podium declared, "We will trample upon America" while the English phrase "We Defeat the United States" can be seen underneath. "The slogans of the Iranian nation on Al-Quds Day show what [Iran's] position is," said the Middle East Media Research Institute. "The slogans ‘Death to Israel' and ‘Death to America' have resounded throughout the country, and are not limited to Tehran and the other large cities. The entire country is under the umbrella of this great movement [of ‘Death to America']." Iran’s defense minister on Monday said the deal also will prohibit all foreigners from inspecting Iran’s "defensive and missile capabilities" at sensitive military sites. "Missile-related issues have never been on agenda of the nuclear talks and the Islamic system will resolutely implement its programs in this field," Iranian Defense Minister Hossein Dehqan was quoted as saying on Monday following a meeting with Iran’s defense ministry. "The U.S. officials make boastful remarks and imagine that they can impose anything on the Iranian nation because they lack a proper knowledge of the Iranian nation," he was quoted as saying. Dehqan went on to claim that Americans must "realize that they are not the world's super power and no one recognizes them as such any longer." Supreme Leader Ali "Khamenei is toying with Obama right now, humiliating him, but Obama is too self-absorbed to realize it," Rubin said. "The best analogy to this would be if Roosevelt made peace with Hirohito who gave a speech under the banner ‘We will bomb Pearl Harbor anyway.’"
"There's a reason why Obama doesn't want Congress to see the agreement," Rubin added. "That is because to examine the agreement is to recognize that it's more an unconditional surrender than an arms control agreement."